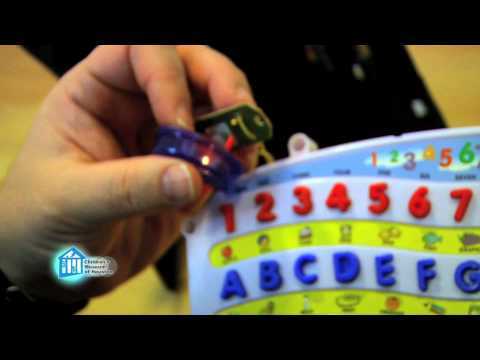 This week, I took apart a toy that is designed to help kids learn their ABCs. You could press the letters to hear each letter and the sound it makes (plus learn some shapes and numbers), it could quiz you to find the right letter/number/shape, and you could make it play music. I recommend starting just by looking around the outside of what you are taking apart. You’ll quickly find the screws holding it all together. Some plastic toys are held together by hidden latches, so you may need to use a flat-head screwdriver to help pry it apart, but first double-check for screws, especially under stickers. Salvage what you can. From the ABC toy, I kept: the batteries, a speaker, a slide switch, and two lights for future project ideas. Make sure to recycle as much as possible as well (i.e. put the plastic into the recycle bin).